If you play the lottery and you want to improve your chances of winning, magayo Lotto is an application that can be of help. The program allows you to analyze statistical data on numbers drawn in the past and identify patterns. It supports lottery games played in numerous countries which include Powerball, Lotto, Thunderball, and others. magayo Lotto is able to pull data about bonus and winning numbers of the lottery game of your choosing regarding recent and past draws. 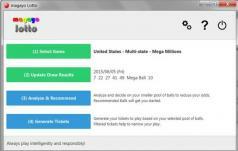 Also, it can import al your played tickets and automatically verify if you’ve won any. Moreover, the application can analyze any data set you’ve downloaded to find relevant stats such as the frequency of a ball, consecutive numbers, certain groups of numbers, high and low number combinations and more.